Thyroid problems can be most commonly caused by either an overactive thyroid gland (hyperthyroidism) or an underactive thyroid (hypothyroidism), both of which can provoke a variety of symptoms, including dry, itchy skin - also known as pruritus. Continue reading to discover the relationship between your thyroid and itchy skin. Thyroid function is closely related to metabolism. The thyroid gland also helps to maintain blood pressure, regulate tissue growth, and encourage the development of the skeletal, nervous, and reproductive systems. An underactive thyroid causes the body's metabolic rate to decrease, thus affecting the skin's ability to grow and repair itself as it should. 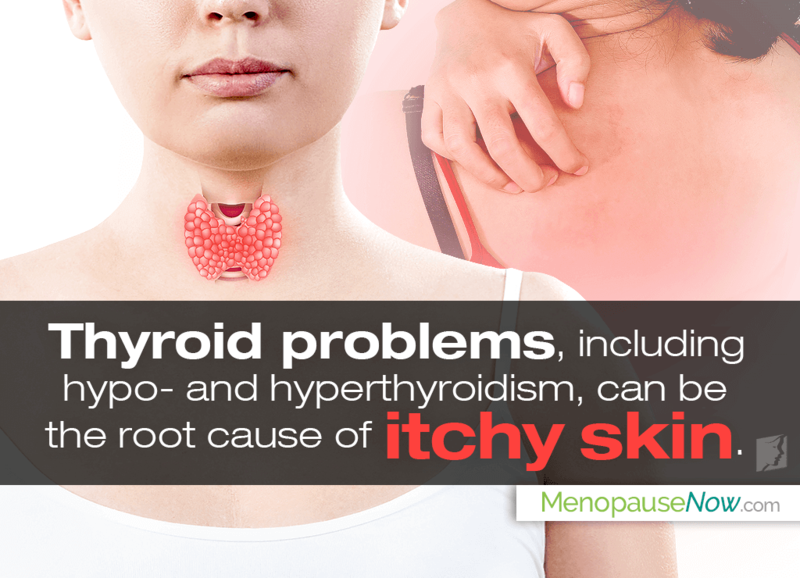 On the other hand, an overactive thyroid gland increases blood flow to the skin, resulting in itchiness. If you are experiencing several of these symptoms together, you may have a thyroid problem. In these cases, it is good to seek the advice a healthcare professional as symptoms can worsen if left untreated. If you think you are suffering from a thyroid problem, you should see a doctor as he or she can prescribe proper treatment relative to your condition. Standard treatment for hypothyroidism involves taking an oral medication of a synthetic thyroid hormone to restore balance, while hyperthyroidism involves taking anti-thyroid medications that prevent the gland from producing excess hormones. Likewise, there are several lifestyle changes that you can try before starting any treatment. Maintaining a healthy and active lifestyle can help restore hormone levels and boost energy. Exercising for 30 minutes at least five times a week can be beneficial for reducing stress, improving mood, deepening sleep, and increasing energy levels. Proper nutrition is also important to prevent weight gain - which is a common symptom of hypothyroidism - and to promote skin health. Try to include plenty of protein, complex carbohydrates, fruits and vegetables, and healthy fats into your diet. Click on the following link for more information on natural and effective itchy skin treatments.